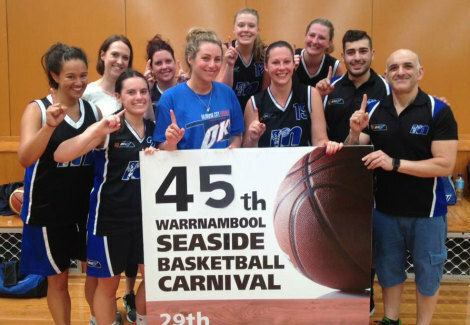 Nine teams from uni made the trek to the seaside basketball carnival in Warrnambool this year and it didn't dissapoint. Without the luxury of a 3rd day of long weekend, events were packed into a tight Friday-Sunday schedule which included two house parties at the Naughton and Clarke residences and a 1.30am Saturday lockout at the Gallery which prevented a lot of unnecessary damage. On the social front the Big V squad saw some excellent performances capped off by rook Will's lemon slicing education and rook James' romantic adventures. 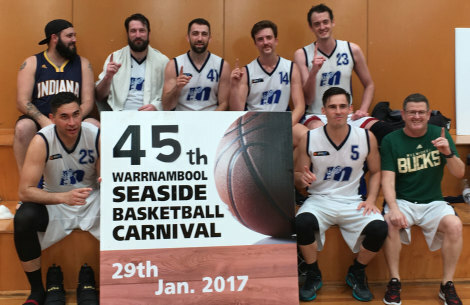 Both the mens firsts and womens firsts successfully defended their 2016 A grade titles by making it through to finals where they found success against Warrnambool teams. Unfortunately, Cheeseworld was closed by the time we got there on the Sunday and so sadly we didn't get a visit in this year but hey, that gives us more to look forward to in 2018. © Melbourne University Basketball Club 2019. This page was last updated by smoke on February 1st, 2017.